I still want a Black Widow movie. I'm sure we won't get one, at least anytime soon, but I still want one and think it would be excellent. My ideal Black Widow film would either be a movie focused on her past or a side adventure where she is mostly alone doing SHIELD/spy stuff. It has been done excellently in comic book form but I still want a BW film. I guess this novel will be as close as I'll get for awhile and although it's not as satisfying as seeing a live action Russian superspy it is a fun read. 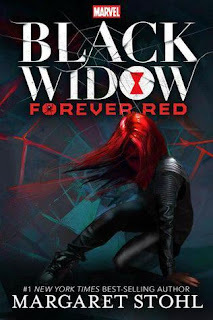 Black Widow: Forever Red is a YA novel written by Margaret Stohl that appears to be the start of a series starring Natasha Romanoff aka Natasha Romanova aka The Black Widow. The story starts with a flashback to a mission in Odessa years ago and the rest of the tale is about the fallout from that mission and Natasha's own tied in backstory. Natasha is an interesting character because she is highly skilled and always references her training as a girl in the Krasnaya Komnata aka The Red Room. The exact experiences that she has there are usually vague with only certain events discussed. This book doesn't go in-depth into her full training and time there but it does do a lot to illuminate what and who made Natasha into the lethal agent that is the Black Widow. 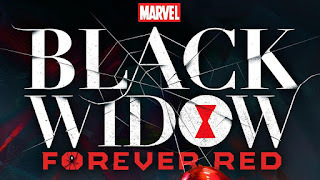 They do this by focusing on two other characters- Ava Orlova, a young girl with odd dreams that Natasha rescues in that Odessa mission and Alex Manor, a New Jersey boy with impulse issues. The novel is mainly about how these three characters end up meeting and having to complete a mission to save the world. A super spy and two teenagers teaming up to keep the planet safe seems like a ridiculous premise by Stohl makes it work by staying compelling and advancing the story while not making it feel rushed. The pacing is very much like watching a spy movie and the novel itself is divided into four parts that feel like movie acts. The inclusion of Tony Stark as Tony Stark and not doing Iron Man stuff and Phil Coulson also makes this feel very much like an installment in the Marvel Cinematic Universe, somewhere after the events of The Avengers or in an offshoot timeline. Tony is Downey in my head, Coulson is definitely Clark Gregg and Scarlett Johansson is Natasha here, albeit a little gruffer. This book is about the journey of identity for these teens but it is definitely a story about an emotional journey for Natasha. Her connections to the people around her is important for getting her job done. She has to reconcile this with who she believes herself to be in her head. On top of that, the mission that she is on in the present time of the book is affected by not only the past of Ava but Natasha's past as well with Ivan Somodorov, a brutal "teacher" in the Red Room known as Ivan the Strange. The action stuff is important but so is the trust that has to be built to get things done in the world of the Black Widow. I enjoyed this book. It's just shy of 400 pages and ii is a quick read. It's interesting enough that I will be reading the second book in the series very soon.